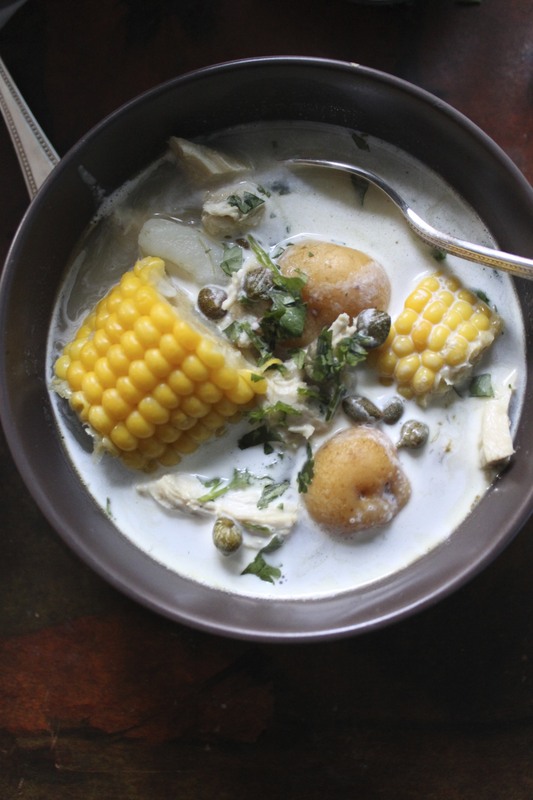 It seems that every time I look for a Colombian recipe, I fall into a soup bowl. With winter going fast and a long weekend to seek out hard to find ingredients, I was finally ready to attempt ajiaco Bogotano. Until recently, I’d only know the Cuban version – a heavy blend of root vegetables, plantains, pork and beef. 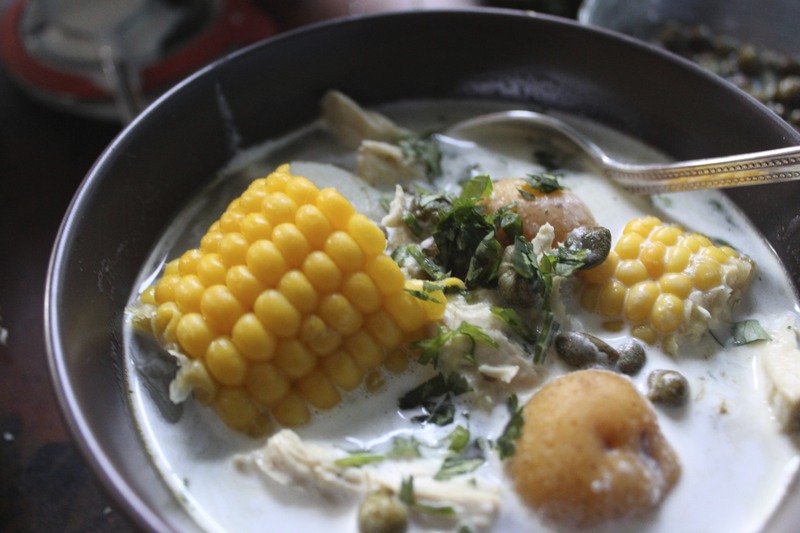 In Bogota, ajiaco is a chicken only affair, thickened with three kinds of potatoes and flavored with cilantro, scallions and guascas, a pre-Columbian herb with medicinal properties and daisy relatives. When I tried it for the first time last year, I loved the ritual of adding your own dollop of thick cream, briny capotes, sliced avocado and even more cilantro from the garnishes brought to the table. Looking for a recipe, my friend Carolina’s mother, Mari Ines, tried to walk me through it on the phone but I wasn’t quite getting it. I knew I’d be home for a few days so I more or less invited myself over see it done first hand. When I finally made it Miami, I could see why it was hard to explain because it’s really about timing. Keeping the broth going at a high simmer, she added the potatoes in different stages so they’d melt into the broth into the broth, breaking apart at just the right point. Buttery and golden, the small, round papas criollas went in last. An extra handful of cilantro or scallions could be added it in at any point. Generous and patient, Maria Ines answered my million questions then set a beautiful table with the promised garnishes, though she never seemed to leave the kitchen. Given the high altitude and low temperatures of the Andes, it’s not surprising that Colombians know their way around a stock pot. It was a long way to go for chicken soup but well worth the trip. Similar but not quite the same as Baby Dutch creamers, papas criollas easy enough to find in post-Colombian Miami but I’d never seen them in New York. Sherrly at Ecualombian suggested I try the markets in Jackson Heights. I hadn’t been on a food trek in while and it was worth braving slow weekend trains to find the right buttery gold potatoes. Put the chicken breast, yellow onion, scallions, cilantro, garlic, salt and peppercorns with 6-8 cups water to cover in a large saucepan or stockpot. Bring to a high simmer. Lower heat and gently simmer until cooked through – about 20 minutes. Off heat, remove chicken from broth and set aside. Remove scallions and cilantro and discard. When cool enough to handle, shred the chicken into pieces, discarding the skin and bones. Set aside. Return broth to a high simmer and add russet potatoes, red potatoes, fresh scallions, and cilantro. Cook over medium-high heat, stirring frequently and adding more hot water as needed, until the russet potato begins to fall apart and the soup thickens, about 30 minutes. Stir in guascas. Add papas criollas and corn and continue to simmer until cooked through, 10-15 minutes. 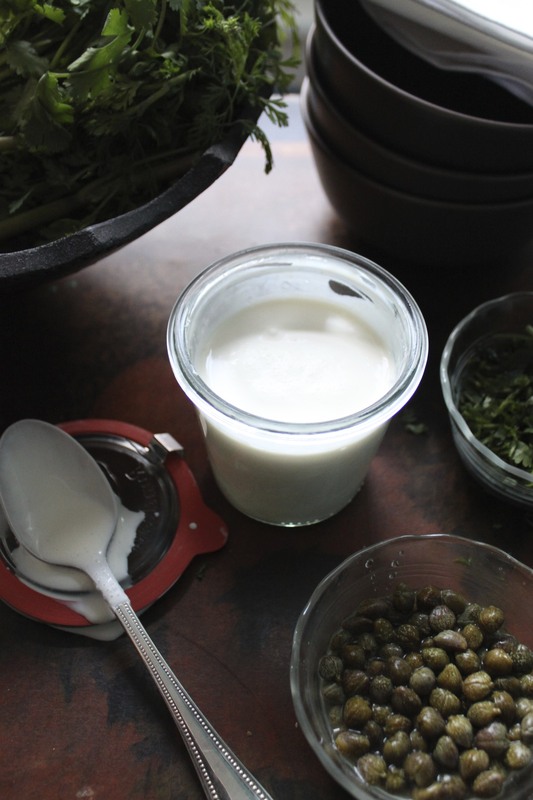 Pour into bowls and garnish with table cream, capotes, and cilantro. Serve with sliced avocado. Well researched, this is a great post – I feel like I could really learn a lot about Latin American cooking from your site. That’s funny because I was looking at recipes for sopa Azteca this weekend! I should definitely try it soon! wonderful post Ana. this is a dish I have grown up with and is dear to me! photos look as delicious as it is. Perfect timing! My guava tree is in full bloom. I’ve made preserves. & juice. I’mready to try this. dessert . How lucky! Let me know me know if you have any suggestions! I included one of your photo’s with a link to your recipe in my post. Let me know if you’d prefer me not to use it and I can take it down. Thanks (in advance! ).